This cutlery set includes 6 forks, 6 knives, 6 dessert spoons and 6 teaspoons. 6 place settings comprising 6 forks, 6 dessert spoons, 6 teaspoons, 6 steak knives. Made from stainless steel. This set has everything to get you started. On-trend design that feel as good as they look! Crafted from the finest quality stainless steel and polished for a brilliant shine. • Finest quality stainless steel tested for durability and performance. 24 Piece Cutlery Set. Multi Colour. Fine quality stainless steel at prices that are spot on! 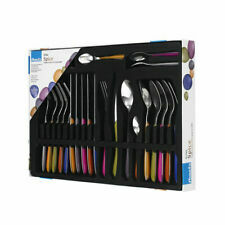 _Set includes; 6 table knives, 6 table forks, 6 dessert spoons and 6 teaspoons Dishwasher safe _Gift Boxed Multi Coloured. Beautifully cut, sleek and dynamic, the best of modern design. Crafted from the finest quality stainless steel with rich, spicey multicolour plastic handles. Fine quality stainless steel at prices that are spot on! On trend design that shines through whatever the occasion. Fine quality stainless steel, tested for lasting durability and performance Real choice and value, to match your taste and your budget! 18/0 Stainless Steel. 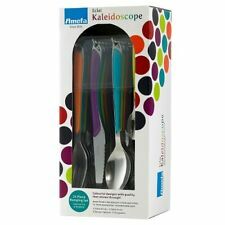 Trust tableware experts Amefa to give your dining room a splash of colour with their Eclat Kaleidoscope cutlery set. The high grade stainless steel set features handles in an array of colours including lime green, turquoise and orange for a multi-coloured dining experience. They're dishwasher safe too, so you can eat and then relax. Fine quality stainless steel at prices that are spot on! Set includes; 6 table knives, 6 table forks, 6 dessert spoons and 6 teaspoons 25 year guarantee Dishwasher safe . Handwashing: It's still the best way to treat your cutlery. But be gentle: avoid scouring pads and bleach detergents. Dishwashing: Go ahead. Use a gentle detergent and rinse agent. Take your cutlery out soon after the rinse cycle ends, then polish with a soft cloth if you want to maintain the natural sheen for longer. The colourful Eclat ranges boasts this wonderful 24 piece set. The colour speaks for itself with 6 bright stunning colours. 6 place settings comprising 6 forks. 22-02-2019 14:03:01. Dishwasher Safe. We know that cutlery may have changed very little over the last 200 years, but the way we eat has. 6 x Dinner Knives 6 x Dinner Forks 6 x Dessert Spoons 6 x Teaspoons. Finest Quality Stainless Steel. Our styles range from contemporary to classic, blow the budget to I'm counting every penny, so there's a place for everyone at our table! On trend design that shines through whatever the occasion. Fine quality stainless steel, tested for lasting durability and performance Real choice and value, to match your taste and your budget! Uber modern and at home on the coolest tables, Carlton is one of the top Monogram patterns that feels as good as it looks. Amefa chose the finest quality stainless steel, and test every single piece for lasting durability and performance. Made from High quality stainless steel and dishwasher safe and gift boxed. This 24pce set includes; 6 table forks, 6 table knifes, 6 dessert spoons and 6 teaspoons. .
Serrated edges on the blade cut through the toughest foods - Dishwasher Safe. Made from high grade stainless steel. 6 place settings comprising 6 forks, 6 dessert spoons, 6 teaspoons, 6 steak knives. HANDY HANGING SET - Table settings can sometimes be a little dull, so we wanted to bring you a quality service with a very colourful twist. Each piece has a splash of glossy brightness and is crafted from mirror finish fine quality stainless steel. COLOURFUL KITCHEN SET - The colourful Eclat ranges boasts this wonderful 24 piece set. The colour speaks for itself with 6 bright stunning colours. The configuration has 6 table knives, 6 table forks 6 dessert spoons and 6 teaspoons. QUALITY GUARANTEED - The full Eclat range is made from fine quality 18/0 stainless steel, is dishwasher safe and comes with a 25 year guarantee against workmanship and materials. - Polka is one of the top Ecalt patterns that feels as good as it looks. - Amefa chose the finest quality stainless steel, and test every single piece for lasting durability and performance. 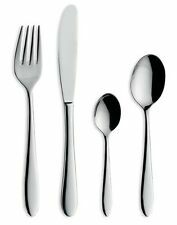 - This 24 pce set includes; 6 table forks, 6 table knifes, 6 dessert spoons and 6 teaspoons - Made from high quality stainless steel and dishwasher safe and gift boxed. They're dishwasher safe too, so you can eat and then relax. Colour: Multi. Stainless steel. The set includes Useful info. Manufactured with finest Quality Stainless Steel. Number of Pieces: 24. This cutlery set includes 6 forks, 6 knives, 6 dessert spoons and 6 teaspoons. Made from high grade stainless steel. HTML Editor - Full Version. - Kings is one of the top Vintage patterns that feels as good as it looks. - Amefa chose the finest quality stainless steel, and test every single piece for lasting durability and performance. - This 24 pce set includes; 6 table forks, 6 table knifes, 6 dessert spoons and 6 teaspoons. - Made from high quality stainless steel and dishwasher safe and gift boxed. - Dishwasher safe. We know that cutlery may have changed very little over the last 200 years, but the way we eat has. 6 x Dinner Knives 6 x Dinner Forks 6 x Dessert Spoons 6 x Teaspoons. Serves 6 People. On trend design that shines through whatever the occasion. Fine quality stainless steel, tested for lasting durability and performance Real choice and value, to match your taste and your budget! 18/10 Stainless Steel. Trust tableware experts Amefa to give your dining room a splash of shimmering colour with their Metallic Eclat cutlery set. A truly exclusive colouring in cutlery, picking up on the metallics trend. The handles are in shades of gold, copper, silver and titanium. Running full tang through the handles for superior control and durability, they're dishwasher safe too, so you can eat and then relax. This set comprises of; 4 table forks, 4 table knives, 4 dessert spoons and 4 teaspoons. Made from high quality stainless steel and Gift Boxed. .
Polka is one of the top Eclat patterns that feels as good as it looks. We know that cutlery may have changed very little over the last 200 years, but the way we eat has. Made from High quality stainless steel and dishwasher safe and gift boxed. Daily food. Young, modern, fresh and intense colors. Pois brings color to the table. Let the cutlery not food leftovers adhering to are, but basically just clean the cutlery after use. If this is not possible, rinse briefly it with warm water. Amefa sûr couverts Set de 24 pièces, comprend ; De Table 6 couteaux de table, 6 fourchettes, cuillères à Dessert 6 et 6 c. à thé. Fabriqué en acier inoxydable de grande qualité. Lavable au lave-vaisselle et cadeau emballé. Partie de la gamme Essentials de tous les jours . - Bliss is one of the top Modern patterns that feels as good as it looks. - Amefa chose the finest quality stainless steel, and test every single piece for lasting durability and performance. - This 24 pce set includes; 6 table forks, 6 table knifes, 6 dessert spoons and 6 teaspoons. - Made from high quality stainless steel and dishwasher safe and gift boxed. 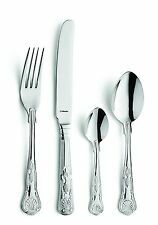 Fine quality stainless steel cutlery set with mirror finish. Florence is the ideal set for the modern dining table. Product properties - 24 set for 6 persons 6 x table knife, 6 table forks, 6 x table spoon, 6 x coffee spoon stainless steel 18/10 stainless steel thickness: 3.0 mm - polished finish gift box - made from high quality 18/10 stainless steel - acid resistant and Widerstandfähig - high corrosion resistance dishwasher cutlery not with adherent leftovers are cleaning and maintenance leave, but clean basically just the cutlery after use. Trust tableware experts Amefa to give your dining room a splash of shimmering colour with their Metallic Eclat cutlery set. From lime green to turquoise and even bold orange, the high grade stainless steel set features handles in an array of metallic hues so you can enjoy multi-coloured mealtimes. Running full tang through the handles for superior control and durability, they're dishwasher safe too, so you can eat and then relax. This set comprises of; 6 table forks, 6 table knives, 6 dessert spoons and 6 teaspoons. Moderno is a beautifully understated cutlery that feels great and looks even better. Superbly crafted. Premium cutlery for the modern dining table. from the best grade 18/10 stainless steel. Set contains: 6 table forks, 6 table knives, 6 table spoons, 6 tea spoons. Simple lines, elegant and stylish. -The cutlery is suitable for the dishwasher. Product Specifications Material Edelstahl. Farbe Silber. Daily food. -24 PCs cutlery set includes: 6 x table knife, 6 x table fork, 6 x table spoon, teaspoon, 6 x. Let the cutlery not food leftovers adhering to are, but basically just clean the cutlery after use. If this is not possible, rinse briefly it with warm water. -The cutlery is suitable for the dishwasher. Material Edelstahl.